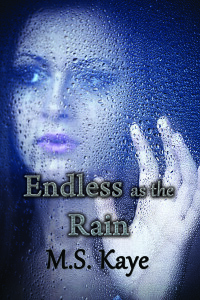 Here’s the moody cover for Endless as the Rain, book one in the Taken series by M.S. Kaye. When Adriane Graham discovers a city councilman is part of an embezzlement ring, she doesn’t realize her life is in danger until Alec Kadan, the son of a mobster, kidnaps her—not to kill but to protect her. But why? And how does he know so much about her, right down to her favorite books? In order to find out, Adriane must get past Alec’s anger and secrecy to unravel his past and find the key to her own. The thought that was still eating at me was the possibility of rejection. I’d heard women talk about how almost any woman can get a man’s attention once, that men generally have a strong drive and will usually take most opportunities. But Alec was strong-minded. If he truly didn’t want a woman, I was certain he’d reject her. One I was willing to take. I peeked into the hall to be certain no one was around, and then walked silently through the shadows. I turned the corner toward his room. My mind couldn’t help but to wander. I began to see images—at first his surprise, and then understanding, and hopefully his arousal. I saw kissing and removal of clothes before lying down. I hoped he wouldn’t feel the need to talk or to ask why. I wasn’t sure I’d be able to hide my true motivations. I wouldn’t trick him like that—hide the truth from him just to have what I wanted. Only a couple feet from his door, I turned, somehow feeling pride, shame, and disappointment all in that one turn. The click of a door opening—his door. I managed not to jump. I turned half way to look at him over my shoulder. “I’m sorry I woke you. I was just feeling restless.” It wasn’t a complete lie. As I looked at him, my resolve wavered for a second. His expression was beyond kind but with a little concern—for my sanity, no doubt. He still wore his slacks and dress shirt but barefoot, and his shirt was untucked and unbuttoned. His hair was a little disheveled, and what absolutely killed me was the slight sheen of his skin, as if I’d woken him from an intense dream. His skin seemed to glow in the faint light, and his eyes took on that deep shadowed effect. Why did he have to look like that? He was perfect in every other way. Why this too? So as not to seem rude, I turned to face him properly. “No. I was just restless. Please go back to sleep.” And please don’t look at me too closely. He took a step closer. At least it was dark. I ran my fingers through my hair to casually pull it back. I crossed my arms, pretending I was cold, but really trying to hide my chest. I worried, though, that I only succeeded in creating more cleavage. Did his eyes just flicker? No, it was too dark to see his eyes clearly. “I’m fine,” I said, “just a little cold.” I turned to leave. He didn’t respond, and I continued my escape. Once my door closed, I pressed my back against it, head leaned and eyes closed. My heart pounded. It shouldn’t be legal to look like that. It was only maybe ten minutes later that I heard his footsteps. The sound of his shoes, no longer bare feet, quickly moved down the stairs. It was only three in the morning.